Customer support : direct email address, phone. 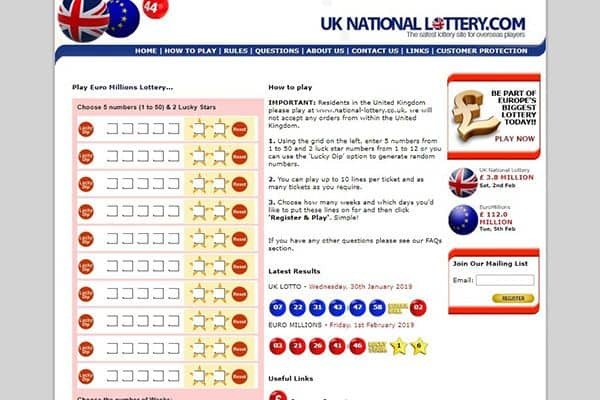 UKNationalLottery.com is an online lottery platform own by St. Peters Marina Ltd., a company developed in 1994 as a result of the number of enquiries gotten from people living in South Africa and Australia about lotteries. During the early years of the British Lottery, it was referred to as UK National Lottery or UK Lottery until it was officially changed years later to “The Lotto”, which might cause a bit of confusion to many that think they are the same thing. St. Peters Marina Ltd. is still being operated by its founders; Darren Clarke, Brian Hunt, and Loraine Dodds, who assist players in placing their lottery numbers and help them in fulfilling their dream to be one of the winners of an International lottery. The UK lotto draws happen every Saturday and Wednesday, while the Euro Lottery draws take place every Friday. After this, the lottery numbers are checked and the lucky winners are published for all to see on the UK National Lottery website twice a week, while the Euro lottery results are published on the site once a week. The website is one of the first online lottery platforms to reach out to non-residents of the UK and offer them a chance to play and win the UK Lottery. The company had the first lines of lottery purchased for a player in South Africa over 10 years ago and has since then extended its reach to players from almost every country in the globe. This is why it is sometimes referred to as an International Lottery site. Going on the website to play a lottery is quite simple. 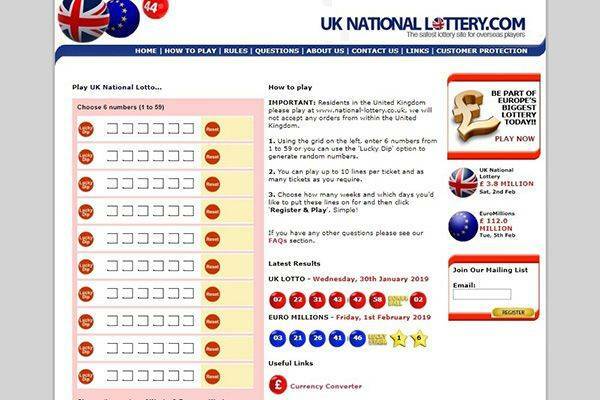 All players have to do is pick their ticket numbers, type it into either the Euro Millions or the UK National Lottery, or just decide to go with the flow and click on “Lucky Dip”. This lottery does not have the option of joining or forming a syndicate, however, the tickets for both the Euro Millions and the UK National Lottery cost £4 with an awesome discount if a player subscribes for a year. Unbelievable… it’s always strange to see a high profile lottery website with no mobile support. There’s an old fashioned desktop view, that would have been fine if was strictly functional, but no mobile view, dedicated mobile website, or mobile smartphone application. A bad practice to say the least. Most online lottery players would use their mobile device, possibly on the go, when they’re ready to play some lottery. The company behind UKNationalLottery.com buy tickets on behalf of the players and send them a scanned copy via mail, while the original tickets are safely stored in a fireproof sale. According to the site, players that win will be able to claim their prize just 24hours after the draws, and some people think it might be too soon if the prize were to be a mega jackpot. Players can claim their winnings by either having their prize transferred to the credit or debit card used to purchase the ticket numbers, a bank account in the UK, or a bank draft or if they decide to pick it up themselves, the company can offer to help with their visa requirements. UKNationalLottery.com holds claim to a 10% commission on every winning depending on if the player decides to cash out or retain their winnings in their account for playing more lottery games on the website. For transfers or bank deposits, some fees apply depending on how players want their winnings paid to them. One thing to take note of is, players have to be 16 years or older to be able to claim their winnings. There’s a questions and answers page on the site for users to self serve most issues that might raise. There’s also a customer protection page with important notice regarding completing a ticket purchase. If an actual customer representative is needed, visitors to the site would find two options in the contact page: an email address and a direct phone line. The email address is said to be checked Monday to Saturday from 9:00 to 17:30 (Greenwich Mean Time). 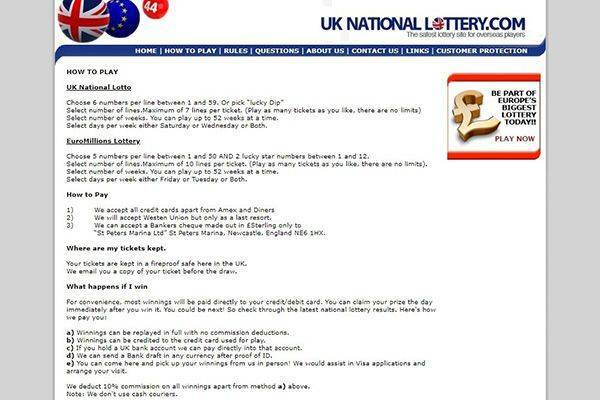 Is UKNationalLottery.com legit or fraud? 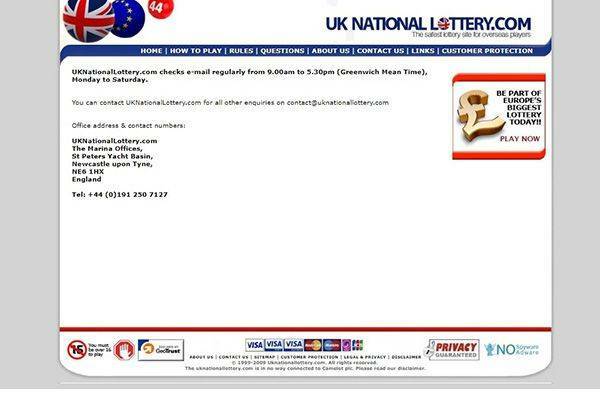 The operation seems to be legit, even thou the name UK National Lottery does give a false impression, as there’s no signal of scams or fraud acts. For a brand launched in 1999, a clean record is a strong indication of legitimacy. 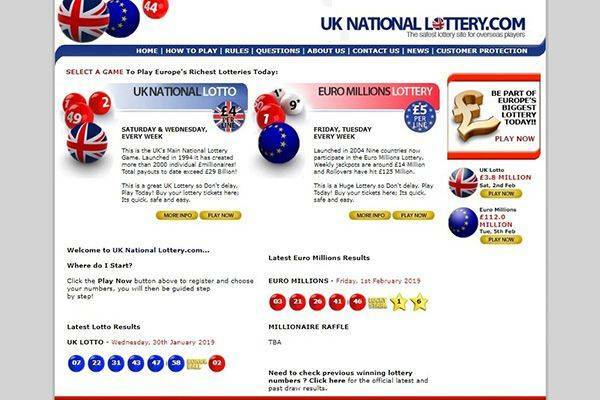 UKNationalLottery.com is a pretty simple and straightforward online lottery website that offers non-residents of the UK an opportunity to be a winner of the Euro Millions or UK National Lottery. One amazing thing about the site is, winnings can be claimed 24 hours after the draws, which is quite faster than most. However, residents of the UK can not play on this site, and a 10% commission is given to the site on every winning. This online lottery website is owned by St. Peters Marina Ltd., a company ran by Darren Clarke, Brian Hunt, and Loraine Dodds. Tickets are usually purchased on behalf of players with the original copy stored in a safe and a scanned copy sent to the Players. The draws are done from Saturday to Wednesday for the UK National Lottery, while the Euro Millions draws are done every Friday, and winnings can be claimed a day after these draws. Launched on 1999, this is one of the oldest lottery brands online. There are good signals indicating the brand is legitimate.